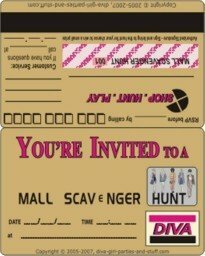 A printable credit card mall scavenger hunt invitation makes a fun addition to any mall hunt event. These invitations are designed to be the size of a standard credit card. Laminate the invitations and they'll even look more like real credit cards. To prepare your invitations, first make a guest list. There are 4 invitations a page, so if you are inviting 8 girls you will need to print two pages. Cut the cards out and fold them in half at the center line between the back and front of the invitations. Glue the back and front together. 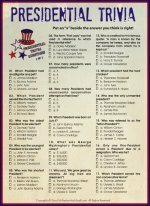 Next, fill in the details of your mall scavenger hunt. Include the date, time and location that you will meet for the hunt. In the sample below we have indicated the meeting place as the mall. If you will be meeting at someone's house, note that location instead. On the back of the card be sure to fill in the date your guests need to RSVP by and the phone number they need to call to do so. Write the names of the guests your are inviting on the line below "Shop, Hunt, Play!" Let your guests sign their own cards. This mall hunt invitation requests that each person bring their card to the event for a chance to win a prize. If you do not wish to do that, simply run a black marker over that section before gluing the invitations together. Otherwise, collect all of the cards at the event and have a draw for a prize. There is a space in the upper right corner to note anything specific you would like your guests to know or bring. The bottom left corner will state the name of the person in charge of the hunt and their number. When your invitations are completely filled in you may have them laminated if you choose. Another alternative is to cover them with clear MacTac (contact paper). It is available at most hardware and department stores and sometimes even sold by the foot. Note: If you choose to cover your invitations with laminate or contact paper the girls will still be able to sign their cards by using permanent marker. Have fun!